I made this over the weekend for Valentine’s Day. 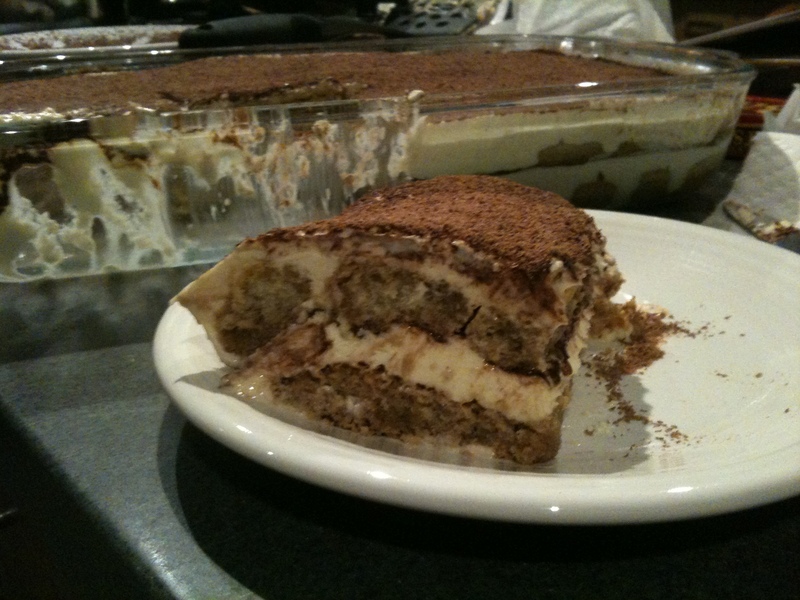 It’s one of the best tiramisu I’ve had – definitely restaurant quality. I assembled it the night before and let it refrigerate until the next day, which allowed it to soak up a lot of the flavors. I got this recipe from my America’s Test Kitchen Season 9 dvd. One thing, you definitely need a stand mixer for this to whip up the mascarpone. Also, I ran out of the coffee mixture to dip the ladyfingers and had to make another batch. Brandy and even whiskey can stand in for the dark rum. The recipe prefers a tiramisù with a pronounced rum flavor; for a less potent rum flavor, halve the amount of rum added to the coffee mixture in step 1. I halved the rum in both steps. Do not allow the mascarpone to warm to room temperature before using it; it has a tendency to break if allowed to do so. Be certain to use hard, not soft ladyfingers. I was able to find them in the Italian section in the grocery store. Even on the box, it said perfect for tiramisu. 1. Stir coffee, espresso, and 5 tablespoons rum in wide bowl or baking dish until espresso dissolves; set aside. 2. In bowl of standing mixer fitted with whisk attachment, beat yolks at low speed until just combined. Add sugar and salt and beat at medium-high speed until pale yellow, 1 1/2 to 2 minutes, scraping down bowl with rubber spatula once or twice. Add remaining 4 tablespoons rum and beat at medium speed until just combined, 20 to 30 seconds; scrape bowl. Add mascarpone and beat at medium speed until no lumps remain, 30 to 45 seconds, scraping down bowl once or twice. Transfer mixture to large bowl and set aside. 3. In now-empty mixer bowl (no need to clean bowl), beat cream at medium speed until frothy, 1 to 1 1/2 minutes. Increase speed to high and continue to beat until cream holds stiff peaks, 1 to 1 1/2 minutes longer. Using rubber spatula, fold one-third of whipped cream into mascarpone mixture to lighten, then gently fold in remaining whipped cream until no white streaks remain. Set mascarpone mixture aside. 4. Working one at a time, drop half of ladyfingers into coffee mixture, roll, remove, and transfer to 13 by 9-inch glass or ceramic baking dish. (Do not submerge ladyfingers in coffee mixture; entire process should take no longer than 2 to 3 seconds for each cookie.) Arrange soaked cookies in single layer in baking dish, breaking or trimming ladyfingers as needed to fit neatly into dish. The ladyfingers will be soft, so you can squeeze them to fit in the last one. 5. Spread half of mascarpone mixture over ladyfingers; use rubber spatula to spread mixture to sides and into corners of dish and smooth surface. Place 2 tablespoons cocoa in fine-mesh strainer and dust cocoa over mascarpone. 6. 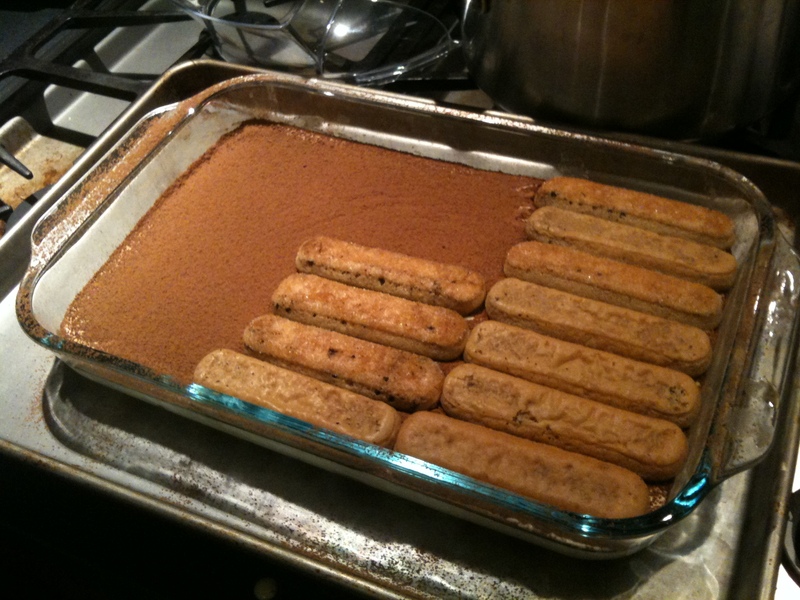 Repeat dipping and arrangement of ladyfingers; spread remaining mascarpone mixture over ladyfingers and dust with remaining 1 1/2 tablespoons cocoa. On the second layer, I laid the ladyfingers in a different direction than the lower section so they crossed. Wipe edges of dish with dry paper towel. Cover with plastic wrap and refrigerate 6 to 24 hours. Sprinkle with grated chocolate, if using; cut into pieces and serve chilled. Both of the ladyfingers below were in the coffee mixture for the same amount of time, but different soaking techniques yielded very different results. Oversoaked: This ladyfinger was fully submerged in the coffee mixture for 2 to 3 seconds. The coffee mixture has penetrated all the way to the center of the cookie. Perfectly Soaked: This ladyfinger was dropped into the coffee mixture, rolled, and removed within 2 to 3 seconds. The coffee mixture has not completely saturated this cookie. 1. Arrange soaked ladyfingers snugly in single layer in baking dish. 2. Spread half of mascarpone mixture over ladyfingers. 3. Dust half of cocoa over mascarpone mixture. Repeat layering. This entry was posted on February 15, 2010 at 5:53 pm and is filed under Dessert, Uncategorized. You can follow any responses to this entry through the RSS 2.0 feed. You can leave a response, or trackback from your own site.